This post includes affiliate links. You can read more at our Legal & Disclosures page. Thanks! Every Monday, Wednesday and Friday, for nearly a year, Cole and Evie have had an emotional goodbye through a chain link fence. It’s like a scene out of some prison movie. They tell each other how much they love each other and are going to miss each other and then I tear Evie away from the gate telling her we’ll see Cole in four hours. Often, I have to carry her writhing body in one arm, while balancing a baby in the other, and haul these girls out to the car. 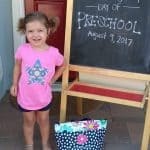 After dealing with this week after week, month after month, Chad and I had to have a serious conversation: Is it time to start Evie in preschool? We had made bold proclamations and decisions on our plan for Evie’s schooling. I’m a stay at home Mom and she’s just fine here with me. She can wait until she’s 3 like Cole did. We can see if they have a spot open in January and if they don’t she can start the next fall. Two years of preschool will be plenty for her. But it seemed she was disagreeing with us. 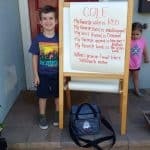 So I asked the Director at Cole’s eternally waitlisted preschool if they happened to have a spot. No rush, anytime really, we’re fine keeping her home as long as we need – oh, what’s that? You already had her on a list because I mentioned it to you once in passing? She can start next month? Yeah, okay, that works too…Suddenly we were launched into preschool prep mode! I bought Evie a lunch bag, did some “Back to School” shopping, grabbed her a water bottle and talked about the impending start of her career as a student. She proudly told everyone, “I go to school with Cole soon!” She was excited. Like really, REALLY, excited. 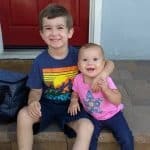 Drop-offs were suddenly much easier, because as they hugged and kissed each other each morning, they’d exchange excited words about how soon Evie would be joining her big brother. She was excited. I was all the feelings. Normally made of stone, the idea of having two kids in school proved too much for my solid core to handle. I just wasn’t sure I liked this. At all. Then it was the big day. We got dressed in one of our new outfits. I busted out the chalkboard easel for important stats and pictures and a giant display of “Evie’s first day of preschool!” I took a thousand pictures of the three kids in every possible arrangement – sitting, standing, two sitting – Evie standing prominently, all three sitting together – Cole in the middle, Evie in the middle, Izzie in the middle – you name it, I probably have a picture of it. Evie looked happy and proud – probably a combination of first day excitement and the promise of a lollipop in exchange for endless smiles. We loaded into the car, drove down to school, hopped out of the car and proudly marched down the hall. Which is about when all hell broke loose. To our complete and utter surprise, our cool, confident, happy-go-lucky, independent daughter freaked the F out. We thought we’d done everything “right” to prepare her! She knows this school, knows the teachers, knows lots of Cole’s friends! Plus the school happens to be on our church’s campus (though not affiliated) so she literally has been in the classrooms since the week she was born! We talked, oh how we talked, about what the first day would entail. And she was sooooo on board. Lest she forgets, this was HER IDEA! But, as is a woman’s prerogative, she reserves the right to change her mind. And oh did she change it. My husband and I looked back and forth for a minute, telepathically running through our options. Us: Bye sweetie!! We love you!! I may have been the one to force us to leave, but I thought of my sweet little baby all day, hoping she’d calmed down and found some fun. I picked her up a few short hours later. Before she saw me, I saw her eating and laughing and I knew we had made the right call. She looked up, saw me, ran and jumped in my arms. 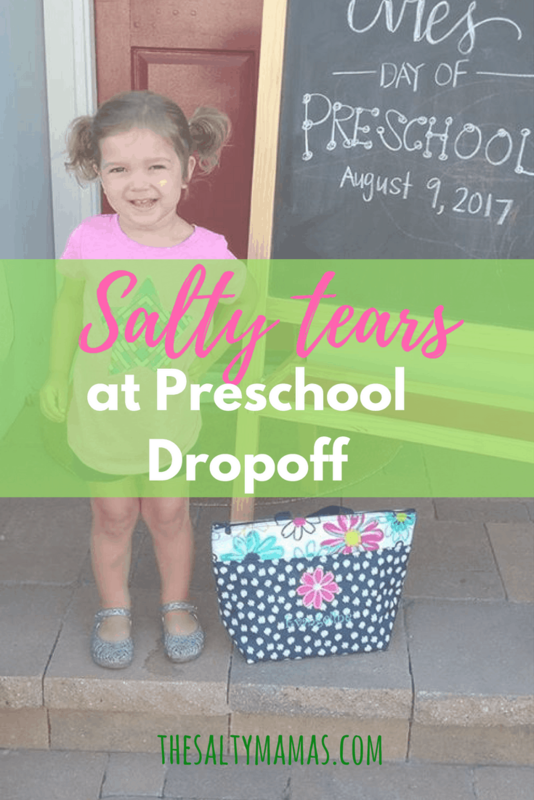 So yes, in the grand tradition of first days of school, there were tears. Lots of tears. Mostly from Evie. But, as terrible as it is to say, the tears were a nice reminder that even though she’s a sassy, independent, stubborn, “I can do it myself” kind of 2 year old, she’s still my two year old baby, that just needs her Mama once in a while. I was thoroughly entertained by this post. I’m still only 35 weeks pregnant but back to school shopping has got me all excited to send my little one off to school for the first time. This feeling may change once he actually gets here. lol. Haha, I loved having an excuse to buy all the back to school stuff! This is so sweet! My oldest is going to preschool next month and I’m already stressing about it, even though I know she’ll be fine. hahaha I cracked up so MUCH reading this! between the “grow a pair” and “I did art and crying” LOL #icanteven ? Thanks! My husband is WAY more likely to have her tears make an impact than I am! So sometimes I gotta wear the pants around here ? Awww, this is such a great post! I could only imagine how tough it is on their first day (for baby and parent). I can’t imagine the mess I’ll be when my little one goes off to school for the first time in the next year or two. Haha! It’s definitely bittersweet. I’m happy to hear that she enjoyed the art! Best of luck to you both! ? She’s LOVING it now, so it seems the drama was very short lived, thank goodness! It’s ALL art, no crying now – just a few very short days later, haha! That’s so awesome! I’m happy that she’s loving it! They definitely are adjustable once they are exposed to something for a little while, especially if it’s fun like art! Haha! ? So exciting for you daughter! Sounds like she is ready for school–and so excited for it! Hahaha, sounds like me getting ready for one of my kids’ birthday parties!! Awe, lil missy! Love this post. Thanks 🙂 You’ll be glad to know she’s 100% back to being sassy, haha!